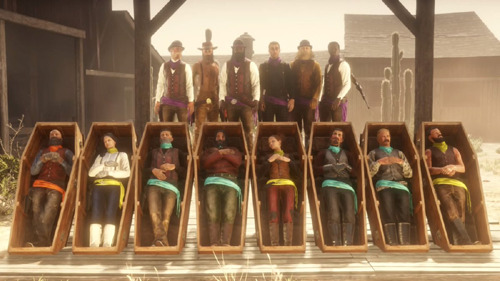 For all of you that are still here and own a PS4, make sure to get your RDR2! This is going to be the master thread regarding all things related to B64 and Red Dead Online (as you might have noticed on B64 Twitter). Red Dead Online is still in Beta, and according to Rockstar, it's going to stay that way for a few months until the development is fully completed. In the meantime, we will be taking over. So if you are planning to get into that RD Online, you are welcome to join our gang (unless you will be making the unwise mistake of taking the opposite side)! I see b64 is coming back to the pwning days? Gun Rush mode has been added to the beta. So far we are a 2-man gang. But I'm sure that's about to change soon. Good luck! Soon to be more, no doubt! oh wow, b64 back to action. good luck bros! No word on how you managed to get our Twitter blocked yesterday? Great to see you coming back to life in another game!